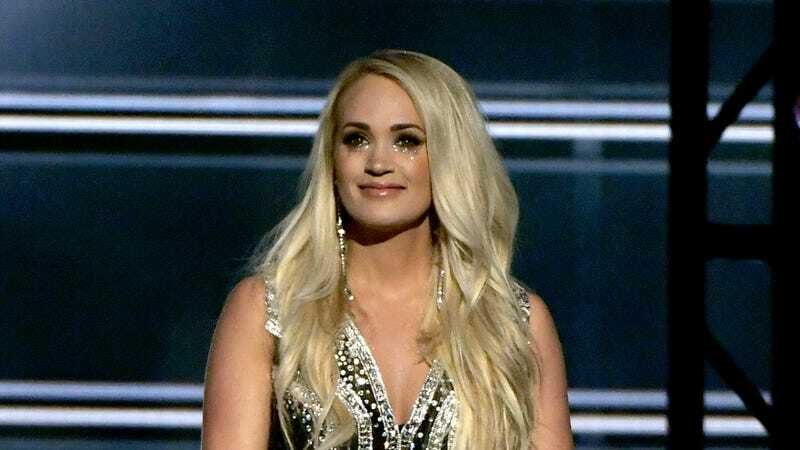 Not only did country superstar Carrie Underwood perform live at Sunday night’s ACM Awards, she shared a photo of her face for the first time since November! While stories about country award shows and celebrities posting selfies wouldn’t typically lead Dirt Bag, this one’s a little different. Primarily because until last night, this whole “what happened to her face” was the strangest celebrity mystery of 2018—in some ways, even weirder than The Bite. On November 10, Underwood fell down outside her Nashville home and reportedly broke her wrist and injured her face to the point that she required “40 to 50 stitches.” Soon after the surgery, Underwood wrote in a blog post, “I’m still healing and not quite looking the same.” It was at that point that everyone decided to put on their conspiracy hats and hunt for The Truth. Why exactly did she fall? Who was she with, and did they have something to do with it? Was this all a cover so she could get plastic surgery and have a sympathetic explanation? These questions were asked even more intensely when a photo of her taken by a fan at her gym made the rounds. In it... she looked exactly the same. Even though nothing truly scandalous appeared to have happened, none of the pieces in the narrative seemed to fit together in a way that suggested any of us knew what was actually going on. And, for people who love celebrity gossip, that can be frustrating! But now that she’s shown herself again, I’m starting to feel like this is an Occam’s razor situation. She probably fell in a freak accident, just like she said, and—horrified by the prospect of facial surgery rendering herself unrecognizable—got ahead of the story by making it seem worse than it probably was. It’s her face! She’s a famous person! Of course she’s sensitive! But she’s also a famous person with access to good doctors, and... they appear to have done a bang-up job, because... I don’t see any difference. The point is, her new song sounds exactly like all her other songs, by which I mean it’s fine and I will probably karaoke it exactly one (1) time. John Stamos is a daddy. Remember how he married that woman who loves Disney World more than most adults? Yeah, she’s the mom.